The Gift That Keeps On Giving! | Jump for Joy! Have you ever received a gift you needed to grow into? Perhaps you remember a time when you wondered why your great aunt Millie kept giving you sweaters that were always three sizes too big. Do you think God ever gives us gifts to grow into? I know He does because I experienced it! From the time I was a little girl, I loved to put my thoughts into writing. I may have been growing up in a small town that seemed quite removed from the world, but in my mind and through my pen, I went all over the world! I had great adventures! I was surprised when I shared some of my stories with a friend and she wanted to “travel with me.” Then I shared with more and more friends. Before I knew it, I was publishing in the school literary yearbook. I was growing into the Gift of writing God had given me. I became a nurse. I continued writing. Sometime I wrote about the joys. Sometime I wrote about the tragedies or things I didn’t understand. Sometime I wrote out of frustration. When my husband read a piece I had written about my concerns of paperwork being valued more than people, he encouraged me to submit the article to a nursing journal. I said no. Sometimes in our growing, we feel we have grown enough. We become used to “growth spurts” and we may not recognize that we are growing constantly. Sometimes we need a little push to allow our natural growth to continue. My husband gave me the nudge. He bet me a dinner the journal would publish it. For me, it was an easy bet. I was sure they would not publish it. Guess who won? My husband is still gloating! Not only did the journal publish the article, but the words went around the world. I received letters and even a telegram about it! God’s Gift kept giving. I went on to publish more articles. Then came a time of significant grief and illness. Having given up writing about life in favor of living what I thought was life, I stumbled under the load of many burdens. Loss of parents, job stresses and many more things crushed my spirit and ultimately my physical body. I sank into a place of physical, emotional and spiritual distress. During eight months of illness, He spoke, and I wrote. I filled notebook after notebook with writing. I whined, I protested, I shouted my words of anger on paper, I questioned Him, I sought His Word and wrote what He had inspired others to write about Him. And ultimately I prayed to Him on paper and praised and worshipped Him. With each new page, old wounds began healing. Dead things began to fall away and new growth began to appear. My Father God healed me! God led me into a new season. My husband and I began to teach a Sunday School class. No literature we found seemed to fit what we felt we were called to do. I asked God what to do. His answer? Write! For three years, I wrote Sunday School lessons for our class. God magnified His Gift by teaching me how to listen to Him and how to write for others. When one of the members of the Sunday School class suggested I share some of the lessons on the church web site, I was reluctant. I now understood I had a Gift from God and I wanted to use it responsibly. The Gift was so precious I felt the need to “protect” it. Very tentatively I offered the Advent series of lessons to the minister. He agreed to publish them on the church web site. I heard from a variety of people, who not only were reading the devotionals, but who were sharing them with their friends! The following Easter, I shared the Lenten series of lessons. Thanks, But No Thanks, Lord! The Advent and Lenten Devotionals ran on the web site for two years. By now, people were asking me when I was going to publish them in a book. Once again, I thought this was beyond where I wanted to be. I sweetly thanked everyone for the encouragement, but assured them anyone could read them on the church web site. While I didn’t feel ready to write a book, I was intrigued by another method of public writing. I had been blessed by reading the blogs of others through whom God sent His Word. I decided to begin a blog. In 2011, I posted the Advent series on my blog. Well, sort of. I intended to post the Advent series I had written for the church on the blog. But … as I attempted to just copy different lessons, God directed me to change some of what I had written originally. When I asked Him what He was up to, He simply laughed and told me He was doing a new thing! I had no idea how much of a New Thing He had in mind! In late 2011, two different publishers called me to follow up on my previous inquires about writing a book. I gave both of them “another time maybe” answers. When I saw what her gift was, I was over the top amazed. My friend, who is a remarkable scrapbooker, had collected all of the advent blogs into a beautiful scrapbook. I was holding a book God had allowed me to write! Through a series of miracles, the Book, Christmas of Discovery, was published in August, 2012. It was marketed around the world! And Now The Gift Comes to You! 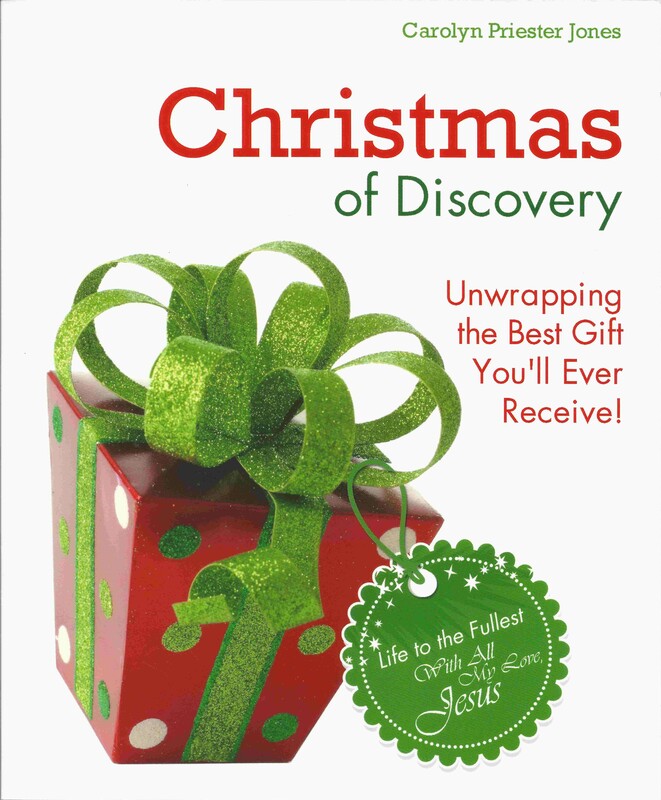 Christmas of Discovery is a book of 32 devotionals. At the end of each chapter, there are reflective questions to draw you into your own conversation with God. There is space for you to write. This book, like the book my friend gave me, is a invitation to you to open the Gifts God has given you. The following link will direct you to the book web site where you will find more information, including a special video invitation to you. To reach the Christmas Of Discovery website, click here. Beginning November 30, a link will be posted each day on this blog that will allow you to listen to my reading of a chapter of the book. I would love for you to share the season with me! And I would also be delighted if you choose to share the Gift with your friends! You can sign up on this blog site to receive an email anytime a new blog is posted. That way you won’t miss any of them. Feel free to sign yourself up and also your family and friends. God does not take back His Gifts. If He has given you a Gift, He will remind you again and again you have it. And He will be waiting to show you how and when to use it! or forget about the people He has chosen. Posted by carolynpriesterjones on November 29, 2013 in Christian, Encouragement, Joy and tagged Book, Christian, Christmas, church, Discovery, Encouragement, Gift, god, HolySpirit, Jesus, Joy, Sunday School Lessons, Writing.